We take a look at our top 3 best electric lawn mowers to suit any budget. With the world’s current obsession with electric gadgets, it is not surprising that electric lawn mowers are very popular. This popularity can be attributed to the fact that these mowers are easy to use and quiet. It is also worth noting that electric lawn mowers are extremely environmentally friendly. Moreover, the fact that they don’t require any gas or oil means that they don’t require a lot of money to run. As long as you have access to electricity, you are good to go. However, you should know that it isn’t all roses when it comes to electric lawn mowers. Even the best of them face some challenges. In order to select the best electric lawn mowers for this review, we had to go through hundreds of customer reviews and ratings. We eventually chose a highly-rated and high-performing lawn mower for each price range. As such, you will find a budget buy, a moderately priced choice and a high-end purchase in this review. Due to its ergonomic design, the Flymo Hover Vac 280 Electric Hover Collect Lawn Mower is extremely easy to use. We also loved the fact that it comes fully assembled and is ready to use right out of the box. Weighing in at only 8.8 kilograms, this lawn mower is pretty light, a quality that will make pushing it around way easier. You will also be happy to know that it folds away compactly for easy transportation and storage. When you purchase this electric lawn mower, you also get a user manual and a guarantee registration card. Considering all that comes with the Flymo Hover Vac 280, it is a wonder that it doesn’t cost more. This Flymo electric lawn mower is perfect for small lawns. Its simple design and sleek look make it one of the most popular lawn mowers on the market today. Ultimately, this is the best electric lawn mower in this price range. Much like the Flymo Hover Vac 280, the Flymo Easi Glide 300 boasts of a powerful 1300-watt motor. Another similarity between these two electric lawn mowers is the fact that they both come with adequate 20-litre grassboxes that are easy to empty. However, the Easi Glide 300’s cable is substantially longer than that of the Hover Vac 280. In many ways, the Easi Glide 300 is simply an upgrade of the Hover Vac 280. For all that this electric lawn mower offers, it is surprising that it’s still quite affordable. It ships with a user manual and a 2-year guarantee. The Flymo Easi Glide 300 is the proverbial good bang for your buck. For its many good qualities, it should cost a whole lot more than it does. Ultimately, the Bosch Rotak 34 R Electric Rotary Lawn Mower is a powerful and effective piece of equipment that is sure to leave your lawn looking pristine. It is an impressive combination of portability, efficiency, and reliability. When it comes to electric lawn mowers, none is quite like the Bosch Rotak 34 R. In fact, it is the best lawn mower in this review. With its unique grass combs, inset front wheels and integrated rear roller, this electric lawn mower is greatly superior to the Flymo Hover Vac 280 and Flymo Easi Glide 300. The Bosch Rotak 34 R boasts of a higher grassbox capacity and cutting width than the other featured electric lawn mowers. This in itself ensures that it cuts and collects grass more effectively than the other two. Although it is a little heavier than the other featured lawn mowers, the Bosch Rotak 34 R makes up for this with its high cutting range of 20 to 70 mm. Though many may find this Bosch electric lawn mower too expensive, one thing is for sure; it’s worth every penny. The invention of the electric lawn mower was definitely one of the best things that happened to lawn owners everywhere. We finally found a lawn mower that is quiet, eco-friendly and doesn’t require much effort to use. Needless to say, we aren’t letting go of it anytime soon. It is therefore understandable why lawn owners everywhere put in a lot of effort into selecting a suitable electric lawn mower. With hundreds of them out there, choosing one isn’t a walk in the park. As such, we were determined to come up with a review that we were sure would make your selection process easier. We selected the featured electric lawn mowers because of their high power, cutting strengths and precision. 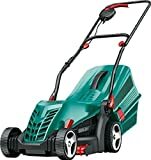 Since we made sure to include a good electric lawn mower for each price range, we are sure you will find what you are looking for in this review.